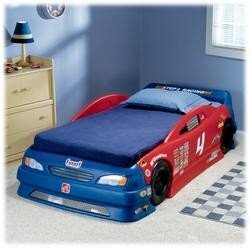 Pretty Things: Zack's new big boy bed! Last night we took the rails off Zack's crib and made it into a day bed, to see how he'd do. We've kept him in the crib this long because he doesn't crawl out of it, and likes it, and we kept putting it off, thinking we might be moving to a new house and we could just start there, but we finally decided he needed one. Zack is SO proud of his new set up -- it took him forever to get to sleep tonight. He's all smiles, pointing out all the features. He's too much! Tomorrow he starts one-on-one swim lessons. He and I have done a number of Mommy and Me water classes, and he's always liked the water, so I hope this goes well. I'm going to be adding a new link on my web site tomorrow called "As Seen In" -- I'm starting to get some notice from publications so as things come out, I'll put them there. Very exciting! Way, way past my bedtime....night!